Like with anything in life, you can find good and bad people to help you with your problems. 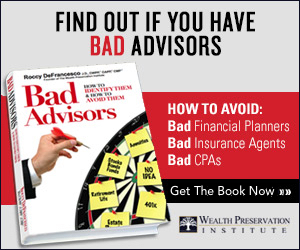 There are advisors out there that you will thank every day of your life for what they’ve done to help you and there are others you’ll wish you never heard of or worked with because of the terrible advice that was given (and the consequences of that advice or worst, the lies that were told or the fraud that was committed). The APS™ considered using the word “Scam” (a fraudulent business scheme; a swindle) to define what we believe are plans you should stay away from, but for “asset protection” reasons, we thought “garbage” seemed a bit less risky. Unlike many areas of consulting, asset protection planning is fairly black and white. That is one reason it was so easy to form the APS™ with the best asset protection experts in the country. Because things are so black and white in the asset protection area, it is also easy for the experts to come to an agreement as to what doesn’t work or what we think will probably not work (and a good asset protection planner will never put a client in a position of wondering whether a plan works or not). Therefore, the APS™, its founders and advisory board have come up with a list of plans you will want to steer clear of. These are listed in priority of concepts or advisors the APS™ institute recommends you stay away from. Before we list the “garbage,” we want to let you know that we encourage the public and advisors to “report” to the APS™ the “garbage” or scams you think you have run into or are being pitched. To report garbage or a scam, please immediately e-mail Email Us and someone from the Society will contact you about reviewing what it is you’ve seen or been pitched (no cost). 1) Bearer Shares. Be very careful when dealing with advisors who tell you that using Bearer Shares is a good way to become asset protected. The theory behind Bearer Shares is that if you don’t physically have them in your possession, you don’t technically own them and if you are asked to testify about your assets you do not have to disclose to the court such assets. This is false and misleading and we strongly suggest you stay away from such plans. 2) Free AP Seminars. There are a handful of advisors who travel around the country doing “free” seminars on “asset protection” for potential clients. Many of these seminars are great for the advisor giving the seminar because even though the seminar is “free,” many attendees buy do-it-yourself asset protection kits in the back of the room (and they are not inexpensive). Some of the kits have useful information and IF used properly by the attendees could work to protect their assets. However, many of the kits have dated material and the kits do not provide the client with custom advice particular to their situation. Worst of all, if the clients try to “do-it-themselves,” and screw it up, they have no one to blame or sue for malpractice. Ironically, many times you can find these kits on E-Bay for pennies on the dollar after a client who purchased one decides not to use it. The APS™ recommends that you do what you need to in order to become educated on asset protection, but be very leary of buying do-it-yourself kits after attending a “free” asset protection seminar. 3) Jim has another to add when he can remember.